Just a quick notice that tonights meeting is a go! I haven't been on top of this site in quite some time. So I will attempt to continue working on the site to keep everyone informed. So in the case of being informed, Mageia 3 RC is finally available for download. I will be doing a review to find out the good, the bad and the ugly on Mageia's latest release. We need to figure out what the club intends to continue supporting. Using the club to inform our members about software/hardware should be the goal, rather then as a teaching tool. We have a lot to discuss when it comes to membership turnout, to what we'll support. Hope everyone can make it! Commodore USA has tried to continue to release computers that will bring back memories of the days of the commodore machines. But is this a memory or something that the Amiga line should have continued with back in 1994? 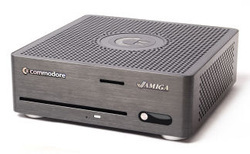 The new Amiga Mio seems to be an attempt to provide an Amiga case more then anything else. This machine is small, but yet powerful. You can find more information about this, 'interesting' machine here. What is your opinion on this machine? Should this be deemed the new Amiga? Lets hear your thoughts. January 10th, 2013 Meeting Scheduled! After a nice long holiday break we are now going to continue on schedule from this date. After today we will continue with every other Thursday evening. On that note, tonights meeting is a go. Now that all issues are resolved, we hope to see everyone out if they can make it. December 13th, 2012 Meeting cancelled! Just a quick note that our next meeting scheduled for the 13th of December will be cancelled. Mason will be turning 10 years old that day and will be a crazy busy day around the house. Hope everyone is enjoying this month so far, as the temperatures are above normal for this time of year! As long as it snows for Xmas, I'll be happy! Have this page added to your RSS feeds for further updates on when meeting dates are scheduled. November 29th, 2012 Meeting Scheduled! Just a quick message that Thursday nights meeting is a go. I hope everyone has had a great November! This has been a strange month in the tech world. Lets see what everyone thinks! Hope to see everyone out again! Remember 8PM! November 15th, 2012 Meeting Scheduled! We its official, we are now living in the Post-Windows 8 world. How much longer will it take for Microsoft's newest operating system to take control, or I mean, win over the hearts of their previous users of XP/Vista/7. Do you think previous users will be compatible with Microsoft's Windows 8? We'll be meeting again Thursday November 15th, 2012! Bring your thoughts on Windows 8, and remember, it may be the latest and greatest of Microsoft, but is it what everyone in the market wants or needs? Hello everyone! This is a quick post to inform everyone that the meeting on the 25th of October will be postponed until next Thursday, November 1st, 2012. In the meantime, keep checking your email and this blog to be informed! Hope everyone is having a great fall so far! Well its definitely fall. The leaves are changing, and the weather is beginning to dip down low. I hope everyone had an enjoyable summer! Our next scheduled meeting is set for Thursday October 11th, 2012 at 8PM. I hope everyone can make it out! We're on the last leg of the move, but we need a few more days to finish defraging. We'll host the meeting in 2 more weeks and then we'll have a great time in our new location! See you at the end of September! We'll be done soon!